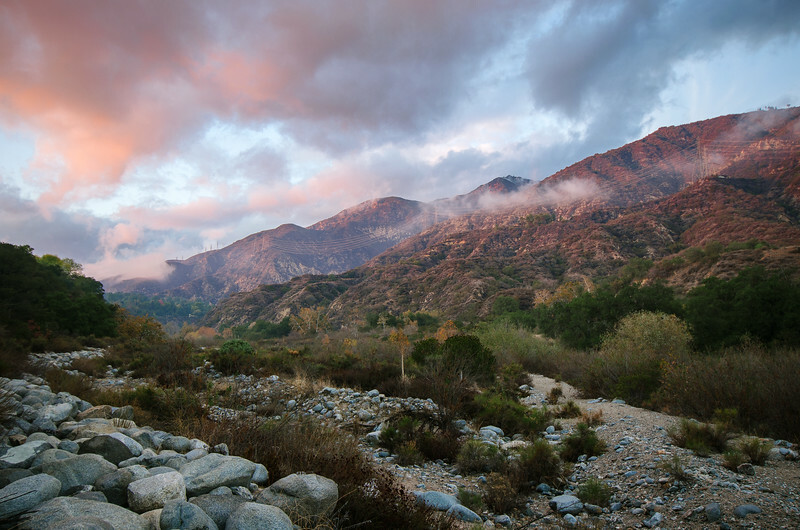 The sunset on Saturday afternoon in Eaton Canyon in Altadena. A storm was in the process of clearing out. I thought it was going to be a little more colorful but can't complain. It might have been a good day to use a graduated neutral density filter -- but mine was dumbly sitting at home. The photo was taken with my Nikon D5100 and Nikon DX 10-24mm wide angle lens. I shot in RAW with the camera on a tripod and processed in Lightroom using VSCO slide film presets. Please see more of my my work at my SmugMug site, where prints are available. Prints are affordable, beginning at $11 for an 8 x 12 are are done by a quality print firm, Bay Photo.